John C. Calhoun is remembered both as an American statesman and political philosopher. From 1811 until his death, Calhoun served in the federal government—as congressman, secretary of war, vice president, senator, secretary of state, and again as senator. Born on March 18, 1782, in South Carolina, Calhoun was largely self-educated before entering Yale as a junior in 1801. After graduating with honors in 1804, he attended law school in Litchfield, Connecticut, and was admitted to the South Carolina bar in 1807. Calhoun entered the U.S. Congress in 1811, and was among those young nationalists known as the War Hawks urging war with Great Britain. His proposals for strengthening the armed forces and financing the war led to Calhoun’s appointment as secretary of war in James Monroe’s cabinet. In 1824, Calhoun was elected vice president under John Quincy Adams. By 1828 he had aligned himself with Andrew Jackson and was again elected to the vice presidency when Jackson won the presidency. Unfortunately, Jackson and Calhoun had become bitter enemies by 1832, and Calhoun resigned as vice president to reenter the Senate. 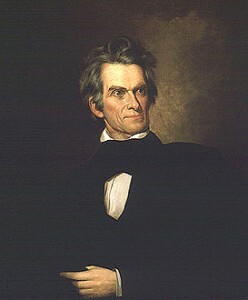 During his terms as vice president, Calhoun turned away from nationalism to become a strong champion of states’ rights. As the antislavery campaign grew in the North, Calhoun, who had merely tolerated slavery, became its strongest defender. In 1844 as secretary of state in John Tyler’s administration, he negotiated a treaty for the annexation of Texas. This effectively preserved sectional balance in the Union by enlarging the area open to slavery. Calhoun’s last appearance in Congress was on March 7,1850, as he heard and approved Daniel Webster’s appeal for sectional peace. 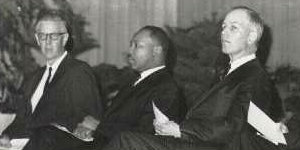 Three days earlier, too ill to speak, Calhoun sat in the Senate as his speech was read for him. He died in Washington on March 31, 1850. 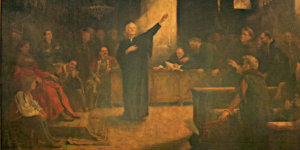 Both John Quincy Adams and John C. Calhoun were founders of All Souls Unitarian Church in Washington, D.C.